For over a decade, NGO Monitor has documented and analyzed the obsessive targeting of Israel by Ken Roth, the head of Human Rights Watch (HRW). In this process, we have examined Roth’s numerous false factual claims regarding events involving Israel, as well as blatant double standards and large-scale distortion of international law in order to promote his personal and ideological objectives. This summer’s 51-day Gaza war was no exception, and if anything Roth’s activities, particularly on Twitter, reflected even greater personal animus towards the Jewish state and even less credibility. 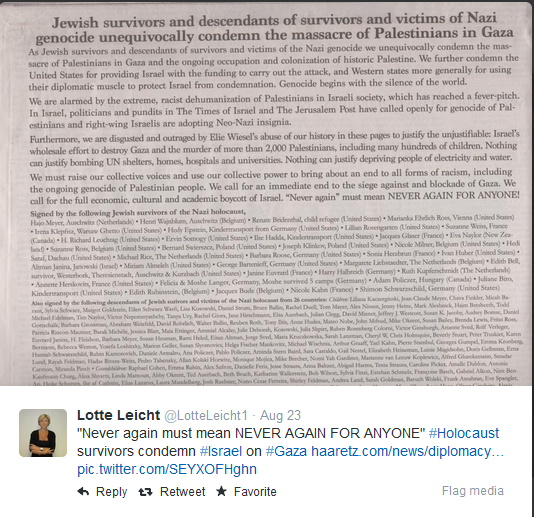 The picture was originally posted, under the tagline “‘Never again’ must mean NEVER AGAIN FOR ANYONE!,” by HRW European Media Director Andrew Stroehlein, and was also tweeted by HRW EU Director Lotte Leicht.